SEAPROF - Tool for accurate calculation of sonar performances. SEAPROF lets you know the real performance of any sonar or sonobuoy with their distance taking into account the bathythermography and depth range, in any part of the world. Its efficiency has been tested at sea and validated by NATO. Unlike other systems, sonar performance and distance detection estimates are not theoretical but adjusted to a real scenario. For all types of sonar and platform. This is a portable system suitable for all types of sonar or sonobuoy. It can be installed on the surfaces of ships, submarines, MPA aircraft and ASW helicopters, both stand-alone or integrated into a combat system. Its interface makes it easy to enter the relevant sonar parameters. Once configured with the data, the area to be operated is selected from a global database. The system calculates 3D sonar performance parameters: range, reverberation, detection and counter-detection distances. In addition, the global database can be queried to obtain the sound velocity profile (SVP) and other parameters and used in other systems. For any part of the world. The database includes the speed of sound with the depth, type and orography of the seabed in any part of the world. This is a decisive advantage over other systems where sonar calculation is only based on theoretical models. In addition, a GPS is incorporated to automatically update the position of the vessel. Detection and counter-detection distances in 3D and at 360º. SEAPROF allows you to easily and reliably assess any underwater scenarios such as ASW missions, mine sweeping, sonar training or diver detection. It calculates and represents the detection and counter-detection probabilities graphically in 3D, thus offering more information on the environment in a single image which can be interpreted more quickly. In other words, it calculates and analyses sonar performance in 2D (distance – depth) and 3D (angle – distance – depth) at 360º. This characteristic allows for faster decision-making since, by visualizing a single screen you will know the best angle to detect or be undetected. The system’s proven efficiency at sea has been validated by NATO’s CMRE (Centre for Marine Research and Experimentation), with propagation models and global databases, in which it was determined that the system gives realistic and accurate predictions of sonar performance. The system has been widely used for various sonars and in different scenarios. 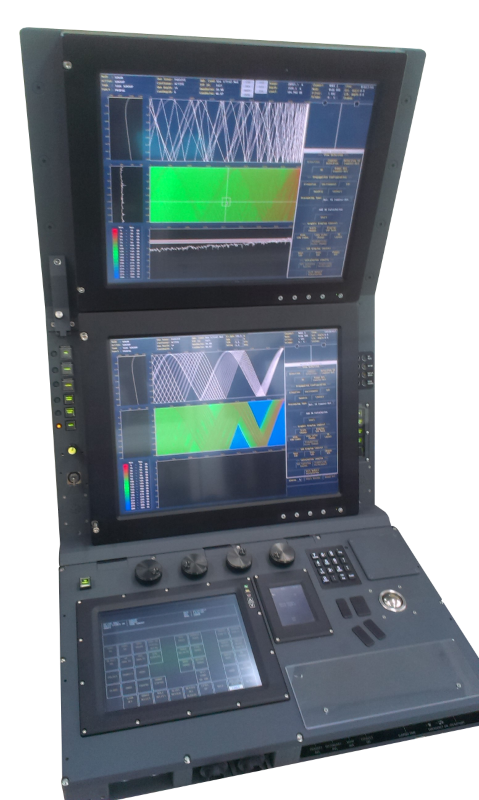 SEAPROF is the tool used for calculating sonar performance on the S-80 submarines of the Spanish Navy. Ray-tracking calculation, propagation losses, transmission losses, figure of merit (FOM). Calculation of distances and probabilities of detection and counter-detection. Validated propagation models for low and high frequencies. Calculation of sonar detection probability with calculation and analysis in 2D and 3D at 360º. Operator updateable global database of sound velocity profiles (SVPs). Databases of platforms and sonars that can be updated by the operator. Use of ambient noise values based on maritime traffic and state of the sea. Distance-dependent system for speed of sound and depth.